Google Nexus 9 is an 8.9-inch upgrade to last year's Nexus 7 and a great introduction to Android Lollipop. It just doesn't measure up to the iPad Air 2 in more ways than one. Google's Nexus 9 has been designed by HTC to be the Goldilocks of pure Android tablets and, for the most part, it succeeds at being "just right" next to anything but an iPad. It's not as big as the seriously outdated Samsung-made Nexus 10 and not as small as the ASUS-crafted Nexus 7. Free download this powerful Nexus 9 video converter specially designed for you and have a try freely. What Nexus 9 has going for it more than hardware is the fact that it's the biggest and so far only way to dive into Android 5.0 Lollipop, launched ahead of the Nexus 6. That makes it a sweet enough Google tablet in more ways than one. It's the silver bullet tablet entry that costs a little more of your hard-earned gold. I'm talking about the latest Nvidia 64-bit processor, a decent 2GB of RAM, dual front-facing speakers and a decent battery to keep it all up and running for a little over nine hours. Many people use Google Nexus 9 to watch movies. By visiting Google Play, we can enjoy lots of hot movies. At the same time, it's also a good idea to stream some local video files to Google Nexus 9 for playing. First of all, let's have a look at the video files supported by Google Nexus 9. As you see, it only supports very limited video formats. However, there are a variety of video types in our lives. Such as MKV, VOB, MOV, M2TS, Tivo, AVCHD, MXF, MOD, EVO etc. These files can't be streamed to Google Nexus 9 for playback directly. You have to convert them in advance. How to convert AVI/WMV/FLV videos to Nexus 9? 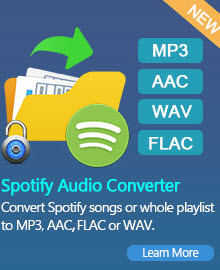 Any Video Converter Ultimate supports converting all kinds of video formats including MXF, MOV, M2TS, OGM, RMVB, RM, WMV, QT, FLV, MOD, TS, TP, DVR-MS, Divx, etc. to AVI, WMV, MP4, MPEG-1, MPEG-2, FLV, SWF, MKV, 3GP and 3G2. Here the following is a brief guide on how to convert any other videos to Nexus 9 with Any Video Converter Ultimate. Choose output profile "Google Nexus 9 Tablet MPEG-4 Movie (*.mp4)" in the profile drop-down list. For better enjoying videos on Nexus 9, you can customize video and audio options, such as Video Codec, Video Bitrate, Audio Codec, Audio Bitrate, Audio Channel, Disable Audio, etc. Click Convert Now! 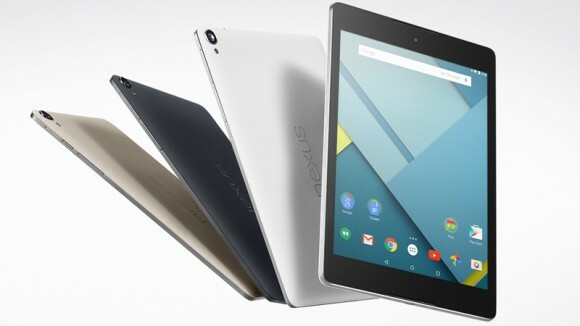 button to start converting videos for Nexus 9. Once the conversion is finished, you can click "Output Folder" button to get the output MP4 files. Then connect your Nexus 9 with computer, import output videos into it, and have fun! With this powerful Nexus 9 Video Converter, you can easily rip DVD to MP4 video formats compatible with your Nexus 9. Any Video Converter Ultimate is also an excellent DVD ripping software which can help convert both of your NTSC and PAL DVD to MP4 for Nexus 9. Besides MP4 format, the DVD converter can rip DVD to AVI, MPEG, MKV, ASF, WMV, M2TS, FLV, MP3, WMA, etc, with high quality. 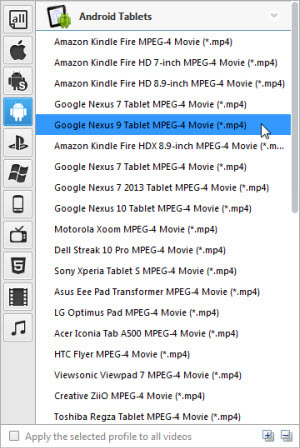 With Nexus 9 Video Converter, you have the ability to select DVD titles, chapters or segments for the ripping, instead of converting an entire movie into one huge file; copy protected DVD movies; take snapshot from playing video or DVD movie and save as PNG picture format; extract audio from DVD movies and save as MP3, AAC, WMA, M4A, WAVE or OGG audio files for your mp3 players and mobile phones. Downloading and converting online video from YouTube, Nico, Google, MetaCafe, HowCast, Facebook, Liveleak, Veoh, Vevo, Vimeo, myvideo.de to Nexus 9, iPod, iPhone, PSP, Archos and many other PMPs is also available. Just with a few clicks and several seconds, Nexus 9 Video Converter helps you to save the online video in MP4, AVI, WMV or many other video formats for your portable media devices. Nexus 9 Video Converter is an easy to use yet full featured screen recording tool. It allows you to easily capture streaming videos from Hulu, Metacafe, NetFlix, Blockbuster, iTunes, Vimeo, MySpace, etc. It is also available to record anything on the screen including media player windows, protected iTunes rental video, rental DVD movies, online video web pages, rectangular/freehand regions, desktop activities even the full screen. Read More: How to play iTunes Movies on Nexus 9? Apple encodes iTunes movies and TV shows with DRM protection. If you transfer the movies you downloaded from iTunes store to Nexus 9 directly, you will find that the iTunes video file cannot read properly on Nexus 9. With a concise interface, the M4V Converter Plus is quite easy for operation regardless of your level of experience. 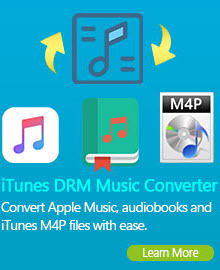 Download the trial version of M4V Converter Plus to have a try!